- Output current up to 5.0A. - Suitable for 2-Phase and 4-Phase motors. - High speed optoelectronic isolation signal input. - Single-chip PWM bipolar sinusoidal chopper ensures low vibration and high efficiency. - 1, 2, 4 (New Mode), 8, 16 adjustable microstep control, motors run more precisely and smoothly. - Equipped with the 3rd generation of breakout board, display panel and control pad to control the motor manually. - Overload, overcurrent, overheat, overvoltage and undervoltage protection to avoid damaging your computer and devices. - Cooling Aluminium Box Design for Cooling, and protect the driver board from being damaged by dirt, dust or other liquids. - The TB1H is a high performance microstepping driver based on the latest original for TOSHIBA high-efficiency TB6600HG for IC. The TB6600HG adopts single-chip PWM bipolar sinusoidal chopper to ensure the low vibration and high efficiency. - Moreover, the brand new design with BiCD0.13 (50V) process technology on the chipset also ensures maximum 5.0A output current and 50V output withstand voltage. 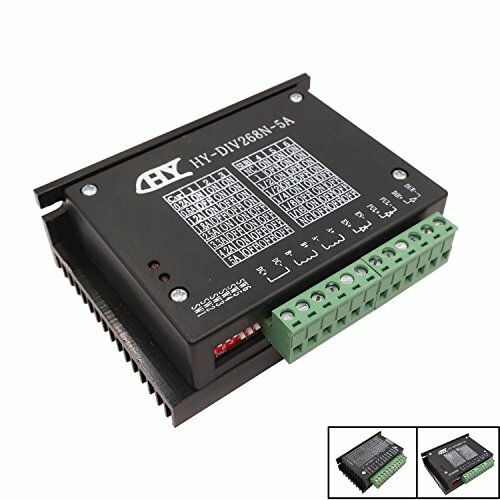 ►1 x HY-DIV268N-5A TB6600 Stepper Motor Driver Controller. If you have any questions about this product by WINSINN, contact us by completing and submitting the form below. If you are looking for a specif part number, please include it with your message.